In the chaos following national elections in Honduras on November 26, Canadian authorities must take a strong public stand and forcibly denounce evidence of electoral fraud and violent repression of public protests. 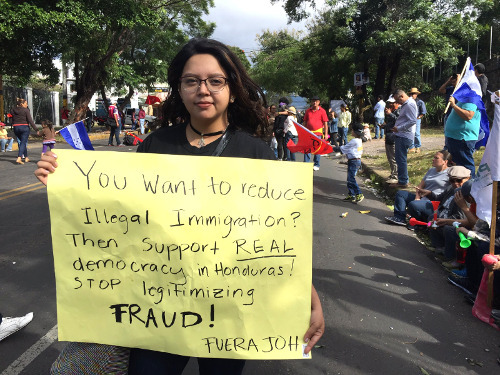 Across Honduras, tens of thousands of people have been demonstrating their discontent over evidence of electoral fraud by the government-controlled electoral tribunal. As widely reported, while early trends in the vote count indicated that opposition presidential candidate Salvador Nasralla was on track to win, delays, irregularities and evidence of vote-rigging since then favour the incumbent National Party candidate, Juan Orlando Hernández (JOH). Even prior to the November 26 vote, Hernández’ attempt at reelection in the face of Honduras’ single-term limit had been challenged as unconstitutional. When former President Mel Zelaya was ousted in a military-backed coup in June 2009 he was accused of trying to seek reelection. Since that time Honduras has become one of the most dangerous places in the hemisphere to fight for protections of land, environment and just about every individual or collective human right. The Committee of Relatives of the Detained and Disappeared in Honduras (COFADEH) has reported that at least 14 people have been killed as a result of violent state repression against protests, most by Military Police. As well, there have been 51 wounded, 7 seriously, and 844 detained in the first five days while the Honduran government suspended constitutional guarantees across the country starting December 1. 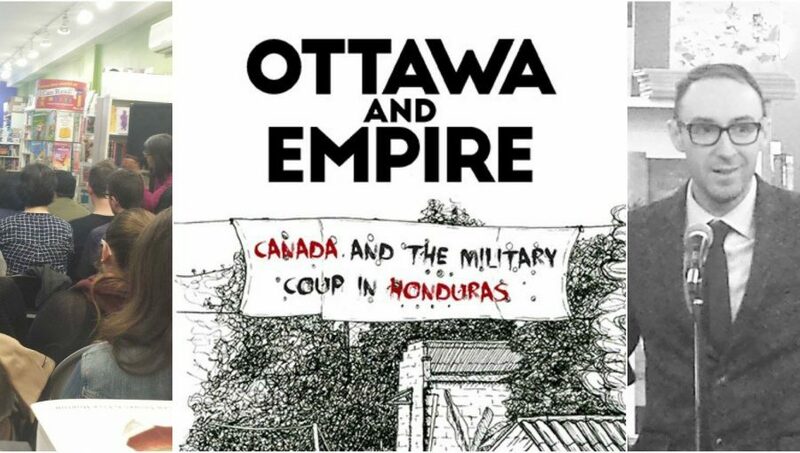 In this context, it is vital that Canada take steps to halt its support, political and economic, to the Hernández regime. 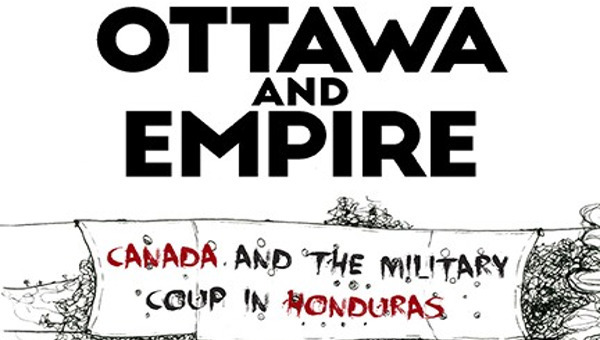 This is undoubtedly also related to the importance of Canada’s bilateral relationship with Honduras, as one of the key international players that has helped to legitimize and prop up corrupt and repressive National Party-led regimes in the country since the military-backed coup of June 2009. Between 2009-2013, the Canadian government lobbied for and helped to finance technical support for a new mining law that favours foreign investment in the sector, as well as signing the Canada-Honduras Free Trade Agreement. Canadian mining companies are very active in Honduras and enjoy extensive support from the Canadian government. As such, it is notable then that in her December 2 and 10 statements, Minister of Foreign Affairs Chrystia Freeland did not attribute “escalating tension and violence” or “deaths and injuries” to the Honduran state forces. While the tension and violence persists, Reuters reports that the U.S. has certified Honduras for making progress in the areas of corruption and human rights in order to ensure that millions of U.S. dollars will continue flowing to this country. It is important that Canada not follow suit, but take an aggressive stand against corruption and human rights violations. Canada should suspend its political support to the Honduran government, as the NDP has already called for, as well as any funding that it is providing to security forces and the related apparatus in the country until the Honduran government can verifiably demonstrate that constitutional and human rights of the Honduran people are respected. This article was first published at Mining Watch – Canada . On Sunday night (December 3), one week after the Honduran presidential elections, the streets ring with the clatter of pots and pans and cries of “Out with the dictatorship!” Some groups dare to disobey the government’s curfew and create highway blockades. Among the few allowed out are the soldiers, who patrol the streets with tanks, rifles and tear gas. Also exempt from the illegal state of siege are the members of the Supreme Electoral Tribunal, who have been conspicuous for their absence over the past week. Twice they’ve shut down and frozen the vote count. Since the elections on November 26, they’ve hidden behind their own implausible numbers and discredited procedures. After noting an “irreversible” five-point advantage for Salvador Nasralla, the candidate of the opposition Alliance against the Dictatorship, the tribunal ceased reporting the night of the elections with 57 per cent of the votes counted, and then returned 36 hours later to announce that, miraculously, President Juan Orlando Hernández had taken a narrow lead. The majority of the population that voted to remove the incumbent from office took to the streets. On Friday, the Tribunal again shut down preliminary results, with Hernández maintaining the edge. On December 3 the head of the Tribunal David Matamoros announced the final count of 42.98% for the current president and 41.39% for Nasralla, after examining a little over a thousand counts from polling places. The Tribunal still has not declared a winner, saying it has yet to review disputed ballots. But analysis of the figures reported on the Tribunal’s own website indicates that the irregularities and manipulation go far beyond these 1,000 tallies. The opposition demands an examination of more than 5,000 tally sheets tabulated when the system for reporting preliminary results was supposedly down. International observers from the Organization of American States and the European Union support the demand. The problem of the legitimacy of the Honduran presidential elections began before voters even went to the polls. The Honduran Constitution prohibits re-election in an immutable article, that is, it is not subject to legislative or judicial modification. However, Hernández justified his candidacy based on a decision by the court that attempted to supersede the constitution and lacked any type of legal consensus. Other reports revealed that failure was not an option for JOH, as he is referred to in the Honduran press. The staunch U.S. ally reportedly had a “Plan B” in case his candidacy faltered at the polls. An investigation by The Economist revealed a tape of a training session before the elections led by members of Hernández’ National Party that included inflating his vote, canceling opposition votes and manipulating poll watchers. The obvious violations of the law and authoritarian control over electoral rules and bodies led to a debate on the Honduran left, with one side – among them the LIBRE party led by former president Mel Zelaya – participating actively in the elections by forming a coalition to run a centrist candidate, and the other side calling to abstain so as not to legitimate the process. That debate fell by the wayside with the surprise triumph of Nasralla (pollsters, many likely part of the machinations, predicted a handy win for Hernández). Now demonstrations of tens of thousands of Hondurans demand respect for the vote and the departure of Hernández. But the president, in the context of a political crisis that could unseat him, has been actively earning his epithet of ‘dictator’. The dusk-to-dawn curfew, the military occupation of the country since well before the voting, and repression in San Pedro Sula, Villanueva and other places expose the character of a despot willing to do anything to prevent an electoral defeat he thought he had prevented. 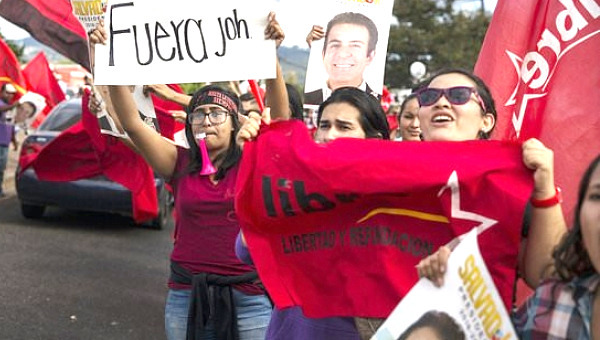 Honduran human rights organizations have issued a flurry of increasingly urgent declarations. Honduran society has changed since the coup d’état in 2009, when, ironically, the military broke the constitutional order with the pretext of preventing then-President Zelaya from holding a referendum to consider, among other issues, the possibility of legalizing re-election. The double standard of the right was lost on no one when the post-coup government went up for re-election. Eight years later, Honduran society is more organized, more unified and more savvy than before. Grassroots and human rights organizations have organized coalitions, many of which have taken leading roles in the current crisis. 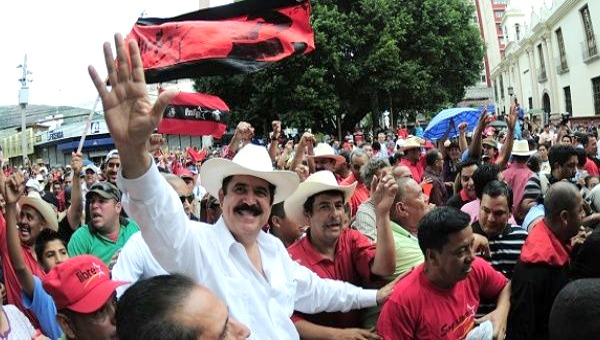 The Platform of Social and Popular Movements of Honduras declared its “absolute and categorical rejection of the fraudulent electoral process that seeks to legitimize the continuity of the model of repression and death, led by Juan Orlando Hernández.” The Platform called for “all organizations, villages, communities and municipalities to mobilize against the imposition and the illegal re-election of the military-civil dictatorship headed by JOH.” It also told its communities to be on the alert to defend their territory against militarization and repression, in fear of land grabs amid the chaos. The National Human Rights Round Table warned, “Honduras is currently experiencing serious democratic setbacks and human rights violations, due to the manipulation of the electoral results of November 26,” and denounced that “the excessive use of force has moved on to terrorism of state” with attacks on peaceful protesters, journalists and media. Honduran security forces created and trained by the U.S. – among them, Los Tigres, identified by the human rights organizations as responsible for acts of repression that have left several demonstrators dead, and hundreds wounded and imprisoned. The OAS, which sent official observers to the elections, has said very little. In a statement on Sunday, December 3 the organization supported the proposal for a special scrutiny of the thousand ballots and also of the 5000 in dispute. There is strong evidence that members of the OAS delegation witnessed irregularities and instances of fraud, however, they have not issued any statement about the process. If fraud in Honduras is consummated with the use of the Armed Forces, the support of the Trump government and the silence of international organizations, what can we expect in the future? Honduras already taught us the negative lesson that a coup d’état will be tolerated in the 21st Century world system. This article was first published at Latin America in Movement . Jennifer Moore is Latin America Program Coordinator for Mining Watch - Canada . She works to support communities, organizations, and networks in the region struggling with mining conflicts. Laura Carlsen writes for Latin America in Movement .